from The Complete Meat Cookbook, p. 458. Lamb, lamb, lamb. Ever since I bought thirty-eight pounds of freshly slaughtered lamb, it’s been a non-stop lamb extravaganza in this house. Last night, I cooked up some of the little lamb chops and tomorrow I’m grilling a butterflied leg of lamb. When I was making up my mind what I wanted to cook last night, I knew I had to reduce the little pile of packaged chops in my freezer. I also had about a pound of seldom-seen-in-these-parts FRESH cannellini beans that I was looking forward to cooking. Cooking the beans was easy. I shelled them, put them in a pot, covered them with water, threw in a big sprig of sage and two whole garlic cloves and simmered them for about thirty minutes. I drained about a cup of the beans when they were still slightly firm to the bite and stored the remainder in the cooking liquid. But I did remove a third of a cup of beans’ cooking liquid for the following recipe. I’m not sure if Aidells and Kelly’s cookbook is still in print, but I found a used copy of it. So far, I’ve made only one recipe from it, the grilled spare ribs recipe I posted here. That pleased me so much that I decided to keep on lambing with it. Last night’s attempt was mostly a success, even with the one crucial improvisation I made. What with the small hillock of lamb chops wrapped in white paper sitting in my freezer, I’m sure I’ll get this recipe to a state of near perfection. This book is turning out to be very promising. Season the chops well with salt and pepper. Heat a large, heavy skillet over high heat and add 1 Tblsp of the oil. Put in the hcops (in batches if necessary, adding more oil as needed) and cook for 3 minutes. Turn and cook them for 2 to 3 minuntes longer for rare (120 to 130 F). For medium chops, add 2 more minutes per side, turning the chops two or three times. Remove the chops from the pan and cover loosely with foil to keep warm while you make the vinaigrette. The meat’s internal temperature will rise about 5 F or so as the chops rest. Pour off all the fat from the pan, leaving any meat juice behind. Put in the stock and scrape up any browned bits from the bottom of the pan. Boil until the stock and juices are reduced to about 1 tablespoon. Add the vinegar and take the pan off the heat. Whisk in the remaining 3 tablespoons oil to make a vinaigrette. Taste for salt and pepper. Place the mint leaves in a small bowl and pour the vinaigrette over them. Steep for 3 minutes. Spread the optional greens on a platter, arrange the lamb chops on top, and pour the vinaigrette and mint leaves over it all. If you’re not using the greens, arrange the chops on a platter and pour the sauce and mint leaves over them. Serve at once. I only sautéed 3 small chops. I cook them for only 2 minutes per side and then removed them. They were still a little too close to medium rare for my taste. I poured off the fat and returned the skillet to the burner. Then I poured in the 1/3 cup of the beans’ cooking liquid. Boy, did it splatter! When reduced, I added the vinegar and let it reduce a little more. Only then did I remove it from the heat and continue with the recipe as given. For the three chops, I used only half of the vinaigrette. Next time, I’ll sauté the chops only a minute and a half, I’ll use chicken broth, and I prepare bitter greens. 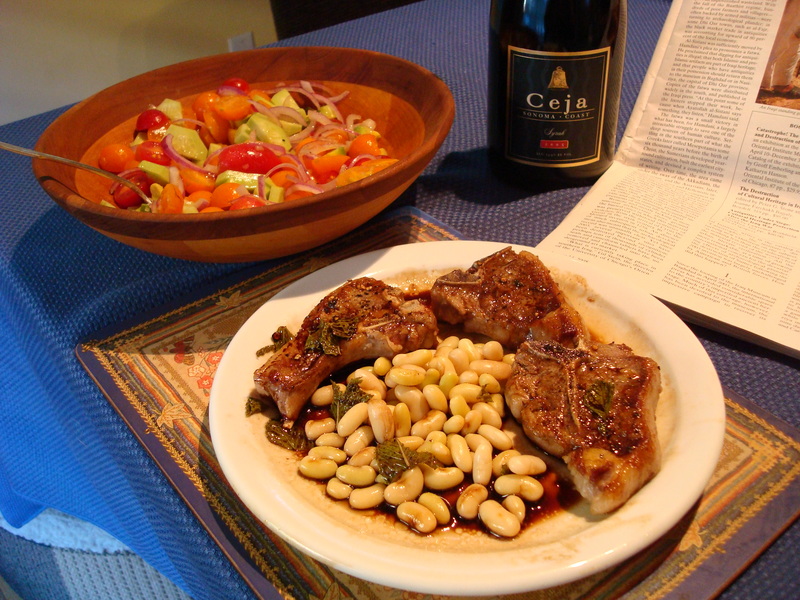 But the beans were delicious with the mint, balsamic and chops. Very good, simple recipe that would work well if you have guests.